"Even when poetry has a meaning, as it usually has, it may be inadvisable to draw it out... Perfect understanding will sometimes almost extinguish pleasure." I have loved to write for as long as I can remember. I had pen pals all over the world...and I mean back in the olden days of putting pen to paper and stamp to envelope and foot to pavement and hand to mailbox. I remember getting over ten pieces of mail some days. I also liked English class. Especially when I got to stretch my creative thought process and share something new and dynamic. I kept journals both at school and for personal use. I have written love letters to my parents, my friends, my siblings, my boyfriends, my husband, my children. I have written for pay and for free. I have written for education, for expression, for liberation. I have written poetry since I was young but got especially into it in high school and write to this day. Literally. I wrote a poem about two hours ago. Sometimes it just makes more sense, it feels better, it seems easier to capture what is creeping up inside me in prose rather than in an essay or long commentary. And so, I ask you today if you have ever tried it? Have you shared it or do you keep it to yourself? I am on both sides. Some I have widely shared and some only few have seen. Some only me. But I will move forward and occasionally share a piece with you. Sometimes, I will pull something from "the archives" and sometime I will share something I wrote yesterday or today. All mean something to me. What do they say to you? This is a piece I wrote in high school during an English exam after being asked to write a short essay or a poem about an article about the Gulf war. He's a lot like me. I have only one question - where do you find the time??? You are brilliant and obviously much more organized than me (unless you are writing at 3 a.m. when you are up anyway). Amazing! As if you should talk Sarah! Where do YOU find the time to do all that you do!?! 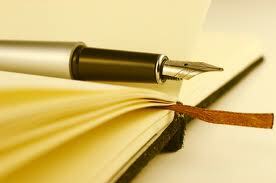 I write when I can, when I am inspired...whenever! I do love it, so that makes it easier. Thanks for your comments! How Do You Start Your First Blog Post?